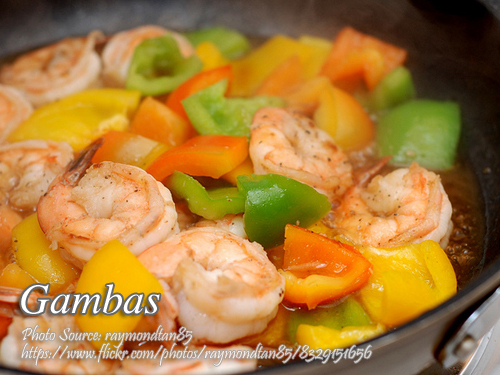 Gambas or sauteed shrimps in garlic chili oil is a very tasty appetizer and a viand too. You can buy garlic chili oil in big supermarkets but you can also make your own. It is very simple and easy to make it. Just peel about 1/2 cup of garlic and combine with 1/8 cup red chili peppers and 1/2 cup vegetable oil. Put it in a blender until the garlic and chilies are finely chopped. Then put in heated frying pan and fry the chili garlic until it turns to brown. Peel and slit gambas at the back part and devein. Saute garlic in garlic chili oil. Add in gambas and bell peppers. Saute for 3 minutes. Season with salt and pepper. Sprinkle with toasted garlic and finger chili. Serve.